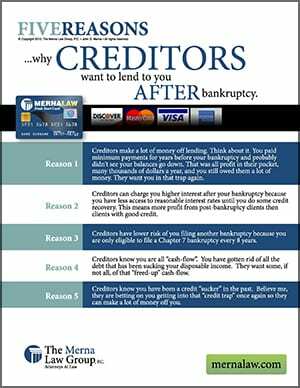 Creditors make a lot of money off lending. Think about it. You paid minimum payments for years before your bankruptcy and probably didn’t see your balances go down. That was all profit in their pocket, many thousands of dollars a year, and you still owed them a lot of money. They want you in that trap again. Creditors can charge you higher interest after your bankruptcy because you have less access to reasonable interest rates until you do some credit recovery. This means more profit from post-bankruptcy clients then clients with good credit. Creditors have lower risk of you filing another bankruptcy because you are only eligible to file a Chapter 7 bankruptcy every 8 years. Creditors know you are all “cash-flow”. You have gotten rid of all the debt that has been sucking your disposable income. They want some, if not all, of that “freed-up” cash-flow. Creditors know you have been a credit “sucker” in the past. Believe me, they are betting on you getting into that “credit trap” once again so they can make a lot of money off you.